In the first article of this “Go Google” series, I explained what Google Apps was as well as How-To register your domain with Google Apps. Today in Part 2 of my series, I’m going to cover creating users in the Google Apps system and then cutting over your domain to enable Google Apps email so both you and your users can begin using the Google Apps web interface for email. The process is fairly straight forward however the groovyPost is fairly long so I figured I might as well create a map for you so you can jump around as needed. Questions or comments, feel free to drop a note in the comments or in our community supported tech support forum. Before we configure Google Apps to receive emails for our Domain Name (cutover the MX records in DNS) we need to first create all the user accounts for our small business, charity etc.. Obviously if we cutover the email before creating the email addresses the mail is going to bounce, which is not good. 2. Fill in the First name, Last name as well as the username and Click Create new user. 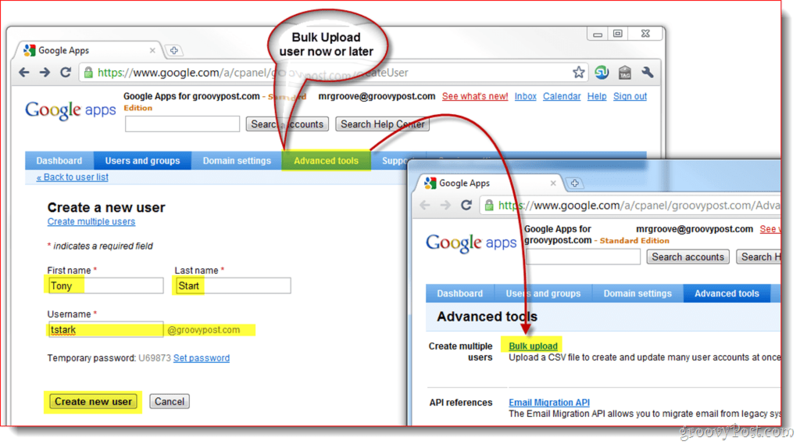 The username will be the users email address and login to Google Apps. If your domain has more than just a few users, I recommend you use the Bulk Upload feature which can be found from both this screen (Create multiple users link) or from the Advanced Tools tab as shown in the Screenshot below. 3. After creating the user, Google Apps will present you with a small popup which contains all the info you need to provide to your employee including their username, password, email address and login link for your domain. Also included for convenience is 2 methods for getting this information to your end user. I recommend clicking the Email instructions button to have the info sent either to you or the new user. 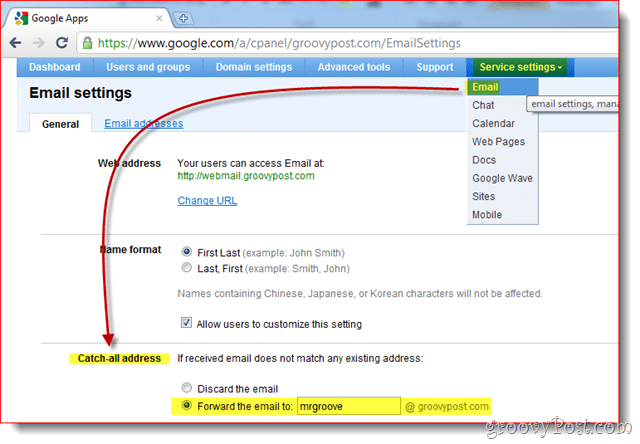 Once all your User / Email Accounts are setup, you should enable a groovy Google Apps feature called the Catch-all address. The Catch-All address does exactly what it sounds like. If someone sends an email to your domain and the address doesn’t match any existing user email address it will be delivered to the address you specify. 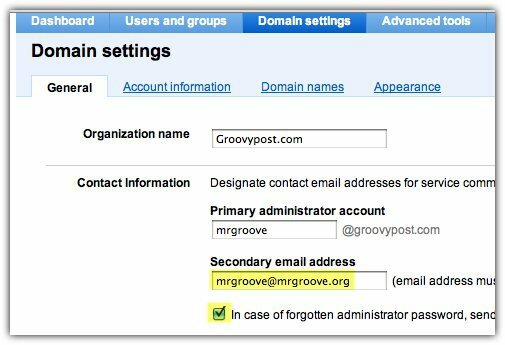 The Catch-all address is especially important for newly migrated domains where you might have forgot to create an email address for one of your employees or departments (like sales@groovypost.com). Rather than drop or return the email, Google Apps will deliver the email to your Catch-all address. 1. Click Service settings, Email. Click the radio button Forward the email to: and Enter the email address for the Catch-All. Click Save Changes at the bottom of the page to save the new config. 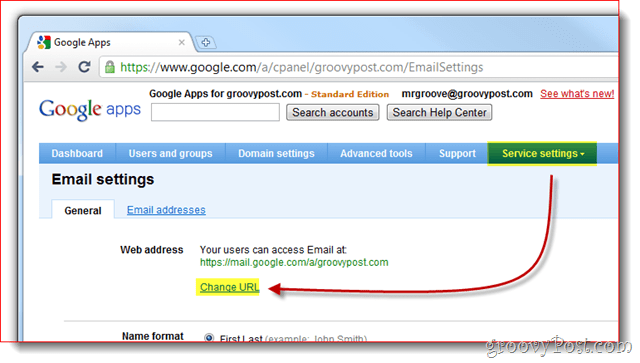 Personally I like to use my Admin account for the Catch-All address because I like to setup accounts on websites using email addresses like dropbox@groovypost.com. Since I’ve not setup that address for any of my users, all those emails will be delivered to my mailbox aka the Catch-All address. Good news, Google Apps gives you the ability to customize the link to something more attractive and easy to remember like http://webmail.yourdomain.com. I highly recommend everyone enable this feature in order to make the transition to Google Apps as smooth as possible for your end users. 2. 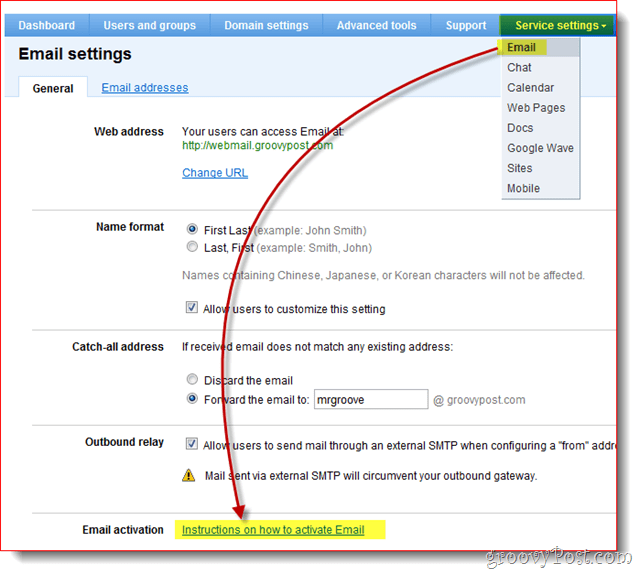 Click the 2nd Radio button then enter the address (sub-domain) you want to assign for your Webmail access. Click Continue when done. 3. 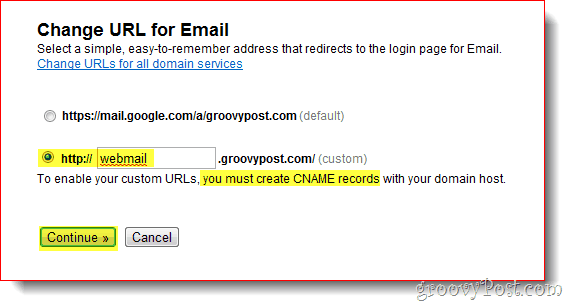 Follow the instructions on the next page to create a CNAME record for the custom address you entered in Step 2 above. #3 and #4 in the below screenshot is the CNAME and destination you need to use when setting up the CNAME record. 4. 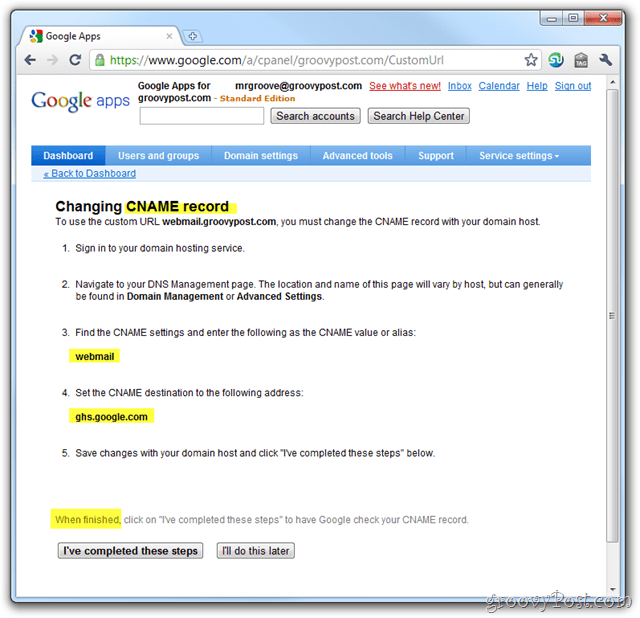 After your CNAME record is created and pointing to ghs.google.com, Click I’ve Completed these steps. Ok everyone, brace yourselves! 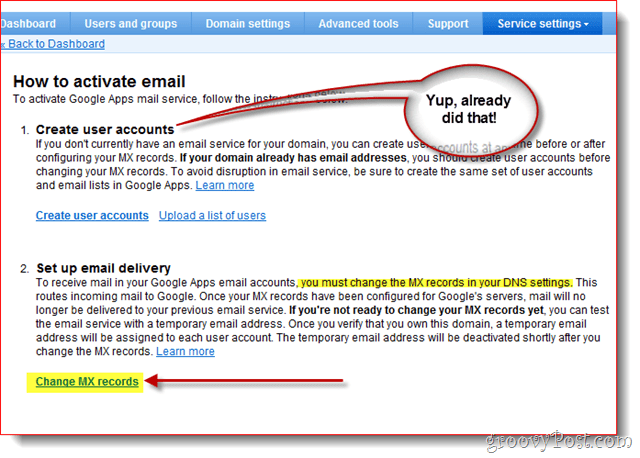 Now it’s time to cutover your MX records which in Email talk means configuring your domain to deliver all future email to Google Apps. This should only be done when your 100% sure all your email accounts have been created and your Catch-All setting has been configured (just in cast). Ready? Once again, to help the non-technical Google Apps customers, Google has provided the steps for changing the MX record for the most common / largest ISP / Hosting providers. If your Hosting Provider is not listed or you are completely confused, rather than continue forward I recommend you get help from your ISP / Hosting provider for step 3 below. 3. Click the down arrow for Showing Instructions for: and Select your Domain/DNS hosting provider. 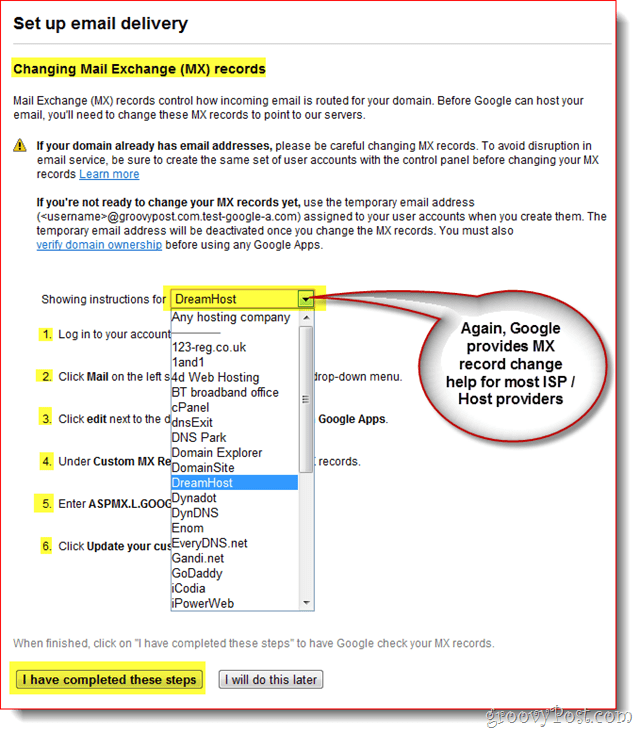 Now follow the steps listed to change the MX record for your domain. When your MX changes are completed, Click I have completed these Steps. Note: Once again, if your confused here STOP. When messing around with your domains MX record, it’s better to pay $15-25 on a support call than make a mistake and break your email for you and your employees. At this point you should be taken back to your dashboard and everything should pretty much be done! Although not necessary, I also recommend you setup time zone info, secondary contact info as well as enable SSL when you and your users visit Gmail, Calendar, Docs, and Sites on your Google Apps account / domain. 1 – Click Domain Settings Tab, General. Under Contact Information, fill in an email address not associated with your domain and Check the box In case of forgotten administrator password, send password reset instructions to secondary contact. There’s still a lot you can do with Google Apps but I think this article is long enough already… ;) So stay tuned for my next article where I’ll review the various options available for connecting to Google Apps to read and manage you email. Great guide — the “change URL” tip is especially handy. 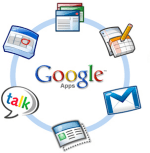 I have been using Google Apps and I have just been bookmarking everything (docs, gmail, apps). 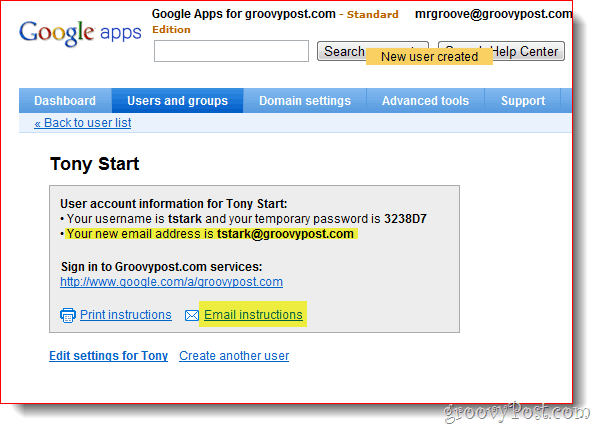 For what it’s worth, you can log in to your Google Apps email just by going to the normal Gmail.com page–just enter your full email address as your username. Didn’t know about the catch all address thnx. I’m wondering if that gets much spam? I’ve set up catchall addresses for a few different domains I own and haven’t experienced much email spam. But then again, none of my domains were particularly prominent. I would say that I get much, much more spam in the form of comments and contact forms. I agree with Jack above. As you can see from the screenshots, I use my primary email address as my catchall and I don’t get any spam actually. The Google Apps email “Gmail” actually does a really good job of filtering out all spam and phishing scams. Again, not needed for the basic user or company but, an option.